One of the best ways your body can naturally deal with stress and depression is by practicing yoga. Yoga is great way to relax the mind and body while also getting in some physical activity. There aren’t many things you need to practice yoga. All you need is a comfortable mat and some space to allow you to do physical poses without bumping into anything. We recommend using a CanDo® Exercise Yoga Mat to perform yoga activities in comfort. CanDo® Yoga Mats are lightweight, yet strong and cushioned. They can be rolled up for portability and compact storage. 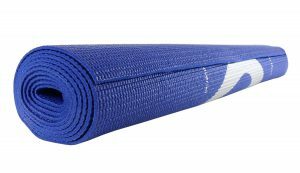 Ordinary yoga mats usually sacrifice cushion, so it can be rolled up and stored in a gym bag. Our CanDo® Yoga Mats offer extra padding with a 0.25″ thickness that is still thin enough to be conveniently rolled-up and taken anywhere. This padding will make sure your body does not ache after practicing yoga on a rough surface. Poses that require you to be on your knees or back may cause pain if you do not practice yoga with a comfortable mat. Regular exercise mats are just as comfortable to use, but do not offer that same portability and individuality as yoga mats do. Regular exercise mats are usually meant for use by more than one person and can be difficult to fold up and easily take with you. The CanDo® Yoga Mat is very portable and provides enough space for one individual. Yoga can be done in a classroom setting or by yourself at home. In a classroom setting, you will most likely have to provide your own mat as yoga does not have to be done in a fixed place. Yoga can be practiced anywhere, even outdoors if it is a nice enough day. A CanDo® Yoga Mat will prepare you for practicing yoga anywhere. Simply unroll the mat out of your gym bag and feel a sense of comfort as the padding of the mat cushions your body. View our selection of CanDo® Yoga Mats today and consult with your specialist to see of practicing yoga is best for you. To view our CanDo® Exercise Yoga Mat, click here.